Spring is the time for many major home remodeling projects. From installing new flooring to upgrading your porch or patio to any other number of home upgrades, warmer weather seems to signal the perfect timing for making renovations. We also know that spring is a prime time for selling a home. While many buyers love a few upgrades, it pays to choose carefully when it comes to your renovations. Why? The design choices you make might not align with every buyer’s tastes, which could hurt your potential for selling in a competitive market. 1. Overdoing it in the kitchen. Yes, granite countertops are appealing to many buyers. However, high-end appliances might not increase your resale value as you would hope. Sure, they are great if you’re planning to use them for the long term, but they probably won’t give your home an edge over others on the market. 2. Being overly bold with your paint choices. Who doesn’t want to follow current trends when it comes to paint colors? But if you’re going bold in a lot of parts in your home, you could be creating more work for yourself when it comes time to sell. Loud paint colors can be covered up, but it can be a time-consuming and costly process. 3. Forgetting about your curb appeal. Don’t get so caught up in renovating the interior or exterior of your home that you forget about your lawn and landscaping. Remember, your curb appeal is one of the first things that buyers notice about your home. Give it proper attention when you’re making renovations too. 4. Leaving out lighting. Like finely-pruned landscaping, great lighting can be an awesome selling point in a home. So, if you’re doing a major design overhaul in any room, don’t forget about upgrading your lighting. Whether it is a new fixture or adding energy-saving bulbs, good lighting can increase your home’s appeal when it comes time to sell. 5. Buying on impulse alone. Typically, there are many parts to a remodeling project. Think about a kitchen renovation. You might choose new flooring, cabinets, countertops, appliances, and hardware. Be sure to coordinate your choices so that you’re creating a fluid look throughout the project. Otherwise, your result could be disjointed and even unappealing to buyers. 6. Only focusing on appearance. Hand-in-hand with coordinating design choices is making sure that your stylistic upgrades are supported by structural renovations too. 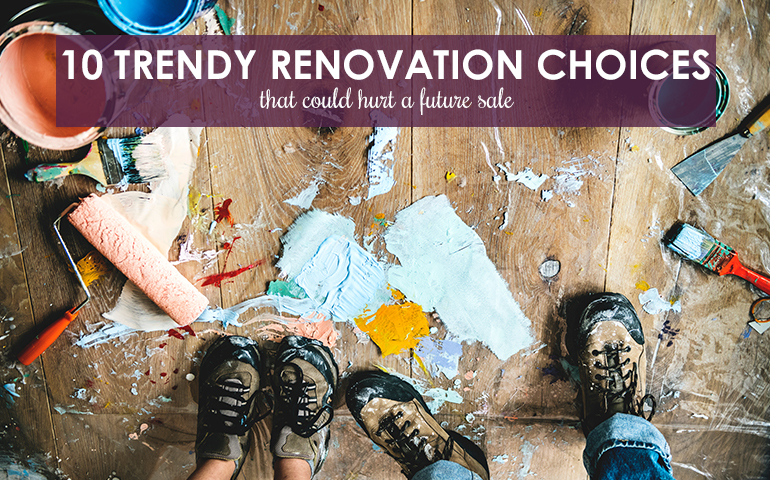 It is one thing for your home renovation to look good, but if it negatively affects your home’s structure, it could cost you far more money – and a potential home sale – in the future. 7. Skimping on good materials. During a home renovation, you want to get the most for your money. But that doesn’t mean you should buy cheap materials simply to achieve a certain look. While they might be appealing at first, lower quality materials probably won’t last, which could cost you more in the long run. 8. Choosing the cheapest contractor. Like good materials, a good contractor can make your home renovation project last. When you’re ready to renovate, be sure to choose a reputable contractor. Otherwise, you could be paying for repairs – or a total redo – when it comes time to sell. 9. Thinking you don’t need a permit. This is especially true if you’re completing your spring home renovation projects by yourself. Be sure to check local regulations before demo day. If you make renovations without a needed permit, you could be fined or even asked to tear down your work! 10. Being the biggest home in the neighborhood. Finally, remember that while your renovations are meant to add beauty and value to your home, they do not need to make it the showiest home in your neighborhood. In fact, if your home is the biggest or most expensive in your neighborhood, you might not recoup your investments when you go to sell. The bottom line when it comes to your spring home renovations? Be sensible if you’re planning to sell in the future. And, if you’re ready to sell now, let us help! Contact Berkshire Hathaway HomeServices The Preferred Realty to get your spring home sale process started.